Chapter 1, Introducing the REST Architectural Style, covers the REST software architectural style and core architectural elements that form a RESTful system. Chapter 2, Java APIs for JSON Processing, gives an overview of the JSON message format, and the popular tools and frameworks around JSON. Chapter 3, Introducing the JAX-RS API, introduces JAX-RS APIs. 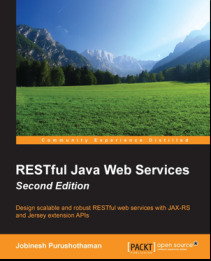 This chapter will explain how to build RESTful web services with JAX-RS APIs. Chapter 4, Advanced Features in the JAX-RS API, takes a deeper look into the advanced JAX-RS APIs, along with many real life use cases and code samples. Chapter 5, Introducing the Jersey Framework Extensions, discusses some of the very useful Jersey framework extension APIs that are not yet a part of the JAX-RS standard. Chapter 6, Securing RESTful Web Services, explores how to secure RESTful web services using the HTTP basic authentication and OAuth protocols. Chapter 7, The Description and Discovery of RESTful Web Services, describes popular solutions that are available today for describing, producing, consuming, and visualizing RESTful web services. Chapter 8, RESTful API Design Guidelines, discusses the best practices and design guidelines that developers will find useful while building RESTful web services. Learning the best practices will help you avoid common pitfalls that others might have faced before. Appendix, Useful Features and Techniques, covers various useful features and techniques that we had deferred while discussing specific topics in this book. This section explores tools and techniques for building, testing, extending, and packaging JAX-RS web applications.